Home / Jensen • Reviews / Jensen VX3022 Review: Is This The Right Unit For You? What is the Jensen VX3022? What makes the Jensen VX3022 unique? Jensen Electronics is no stranger to the car stereo market. In fact, Jensen is credited as making the first car stereo speaker. Jensen did not disappoint with their VX3022. The Jensen VX3022 is a car stereo head unit for double DIN openings. The unit is primarily made up of a large touch display control panel. The VX3022 is the entry-level unit for this series by Jensen. Car stereos manufacturers have a long list of features that are often included in head units. Some are going to be necessary for you and some you will not need at all. There are several considerations to make if you’re in the market for a new car stereo system. This review of the Jensen VX3022 will help determine if this unit is right for you. 1 What is the Jensen VX3022? 2 What makes the Jensen VX3022 unique? The Jensen VX3022 is an affordable double DIN head unit. Double DIN simply specifies the size of the unit, double meaning twice as tall as a single DIN unit. Car stereo head unit sizes using the DIN regulations is standard practice in both the car stereo industry and the automobile manufacturing industry. 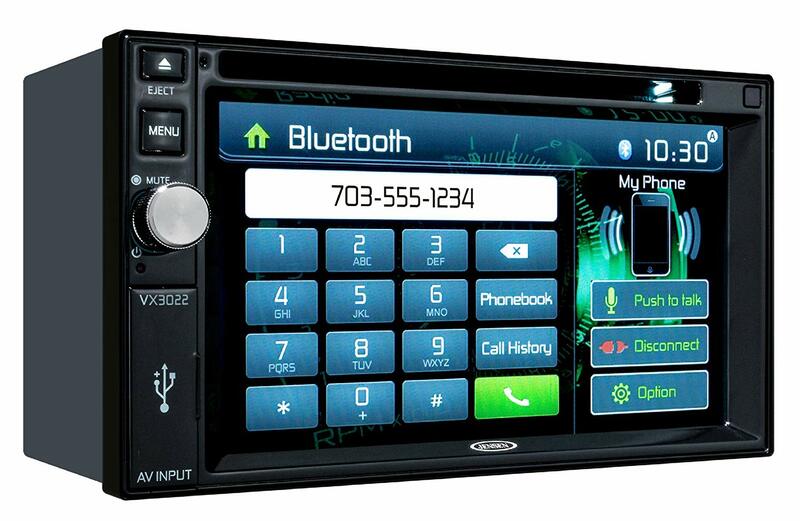 If your car was manufactured with a double DIN stereo, the VX3022 is compatible. To find out if your car stereo is double DIN, all you need to do is measure. Cars with a double DIN stereo will have a faceplate about 7 inches tall and 4 inches wide. A single DIN stereo will be roughly half as tall and the same width. A single DIN is easily distinguishable usually, just by examining the unit, as they are much slimmer than a double DIN. You can always google examples of images each to be sure of the compatibility for your vehicle. If your vehicle has a port for a single DIN, it is too small for the VX3022. While the Jensen VX3022 is a multifunctional stereo unit, it is marketed as a DVD receiver. The truth is however, the unit offers a wide range of entertainment and connectivity options for your drive – not limited to DVD videos by any means. The Jensen VX3022 can play video, stream music, make hands-free phone calls and more. Has all the features I want. The Bluetooth phone feature has an echo when used. The unit has Bluetooth technology allowing many phone operations to be completed hands-free. Bluetooth connectivity allows drivers to keep their eyes fixed on the road and access their phone book and audio controls. Bluetooth also allows for music streaming wirelessly as another option to a USB or auxiliary input. For music streaming over Bluetooth, the unit is equipped with built-in A2DP, or Advanced Audio Distribution Profile, technology. This allows you to control basic phone music streaming functions, such as skipping and adjusting the volume, from the unit, again contributing to a safer and more streamlined driving experience. One downfall of the Jensen VX3022 is the lack of Apple CarPlay or Android Auto. The VX3022 was not specifically designed with CarPlay and Android Auto in mind, likely because these features were not as popular when the unit was release by Jensen. Apple CarPlay and Android Auto compatibility is now a standard feature on many car stereos. The feature allows the stereo to communicate seamlessly with some of the most common types of phones. This means, if you own an iPhone or Android phone, you may have trouble accessing important apps through your stereo. This unit is, however, compatible with an app released by Jensen. This special app allows for connectivity to Pandora, aHa Radio, iHeart Radio, Spotify, Slaker and a few other streaming apps. While app only allows for connectivity with specified streaming services, it will be plenty for many people. When driving, it’s always helpful to know where exactly you are going. Navigation is one area where the VX3022 lacks. In many of its other units, Jensen offers on screen navigation through a partnership with top map database companies. Unfortunately, the VX3022 does not have any navigation capabilities. The best solution to the lack of built-in navigation capabilities would be to use your phone as a GPS and have turn-by-turn directions read aloud over your car’s stereo system. Since most modern phones have built in navigation capabilities, like iOS Maps and Google Maps, this is a decent alternative. This also allows you to use your favorite third-party navigation apps, like Waze or city-specific maps. This will be adequate for many consumers especially considering the price of units can increase significantly if a decent navigation system is included. Phone mirroring capabilities also expand your entertainment options. If your mobile device is mobile data enabled, you can stream video from your favorite apps like Netflix, Hulu, and YouTube as well – perfect for keeping passengers entertained, especially on long road trips. The Jensen VX3022 is reasonably powerful as a standalone unit, but has potential to be improved in terms of expandability. Other units are easily more expandable than the VX3022 but the unit does have some features worth pointing out. As a part of the whole car stereo system, the Jensen VX3022 has 5 preamp outputs, and a rear audio/video output. The unit also has a front USB input, front auxiliary input, a rear audio/video input, and a backup camera input. Additionally, the unit is able to communicate with certain steering wheel controls, a surprising feature for a unit in this price range. The unit has a built-in CD and DVD drive that is ready to play music or watch videos on right away, but if you have Sirius/XM radio, this unit is not compatible. If you utilize Sirius/XM or other similar radio services, you will have to stream them another way like through a smartphone app. The display on the unit is about 6.2 inches. This is fairly large but is not the largest screen available with double DIN stereos on the market today. Though not common, issues are occasionally reported with this unit. Most buyers seem to be happy with purchasing this unit but the three most common complaints are with the quality of audio over Bluetooth, not being able to change the background image on the touch screen, and ambiguity in the manual and instructions. The price of the Jensen VX3022 head unit is very affordable. The price really cannot be beat. Units with similar features can retail at $$$ or higher, and basic single DIN stereos with no video screen and far fewer features retail for about the same price. At this price, the unit could be expected to have less impressive features. If budget is your main concern, this is the unit for you. One of the biggest contributing factors to the price of this unit is that it has been succeeded by several newer lines of head units. This doesn’t mean, however, that the unit isn’t quality. Many consumers are willing to pay higher prices for units that have up to date features but neglect to recognize that cheaper units have nearly the same functionality. Another reviewer remarked that a lack of certain features may be the contributing factor to the lower price. However, considering the unit is considerably more affordable than comparable units, it is an option you will want to at least consider. There is almost no chance you will find a decent double DIN unit for a lower price than this. Again, if budget is a primary concern, the VX3022 is a great option. The Jensen VX3022 is a very popular head unit in the car stereo world because it isn’t short on features and is sold at an insanely reasonable price. This is a budget option. As such, there is no shortage of opinion on the VX3022 on the internet. The unit was named one of MusicAuthority.org’s “Best Touch Screen Car Stereos of 2018”noting that, “The Jensen stereo unit is the unit to go for if the price is your primary concern. It has bare bones features, while still allowing you the luxury of a touch screen stereo. It still has the basic hands-free calling for Apple, Blackberry and Android devices. It does not allow for app navigation through hands-free, however. It still can play CDs and DVDs, with excellent screen resolution for movies. A reviewer at ThoroughlyReviewed.com selected the VX3022 as one of their top ten double DIN head units. A verified buyer on Amazon shared some insights on the unit. The Jensen VX3022 is most commonly compared against the Android 4.2 double DIN head unit. The Android 4.2 is very similarly priced, retailing at around $$ more than the Jensen VX3022, but is vastly more feature rich. The Android unit features 3D GPS navigation, WiFi connectivity, Android Market access for apps, and an included backup camera. However, the Jensen unit comes with the expertise of an company who has been manufacturing electronics since 1915. Some consumers may be wary to purchase an Android based head unit. The Jensen unit also easier to operate. If ease if use is a priority, you will prefer the Jensen VX3022. Similar units, especially those newer than the VX3022, certainly have more features than the VX3022 but will come at a higher price if manufactured by a trusted brand. Then there are off-brand stereo units that will rival the VX3022, but you have to decide if you truth the manufacturer. The Jensen VX7020 is similar to the VX3022 except it also have expanded Android and Apple support and in-dash navigation capabilities. This unit retails for around $$$. The two extra features can make the cost go up quite a bit. The VX3022 finds a nice balance around price, manufacturer credibility, and feature-richness. The Jensen VX3022 has a noticeable lack of features, but I don’t think that’s what is to be expected for a retail price of $$$. As mentioned previously, it’d be difficult to get a decent entry-level single DIN head unit for this price, even without the video screen. The fact that the VX3022 can provide what it does at for the price is astounding. The VX3022 is a reasonably priced, reliable, car stereo head unit that has the most popular features in car stereos today. If the lack of some features is something you are comfortable with, given your specific needs, go ahead and purchase this unit. You know best about what features you need in a car stereo. The Jensen VX3022 is a very popular head unit in the car stereo world because it isn’t short on features and is sold at an insanely reasonable price. This is a budget option. Jensen Electronics is no stranger to the car stereo market. In fact, Jensen is credited as making the first car stereo speaker. Jensen did not disappoint with their VX3022. Good price, good screen and Has all the features you want But The Bluetooth phone feature has an echo when used.